Xolo X1000 the phone with Intel inside® was launched back in March this year. Xolo X1000 boasts a 4.7-inch HD 1280 x 720 pixels capacitive touch screen 2.5 D Edge-to-edge curved glass display at 312 PPI. Under the hood it has a 2 GHz Intel Atom Z2480 processor with a 400 MHz PowerVR SGX540 GPU. For snapping images you get a 8 Megapixel camera with BSI sensor and a 1.3 MP front-facing. Featuring all common connectivity options it has 1GB RAM, 8 GB internal memory, up to 32 GB expandable memory with microSD. 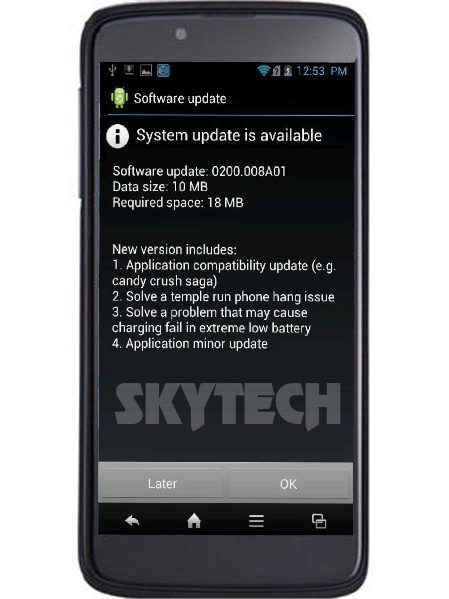 The phone was initially launched with Android 4.0 ICS and was promised to be upgraded to Android 4.1 Jelly Bean. And finally the wait is over the Jelly bean update is out now and ready to be installed on your Xolo X1000. Its very easy process as its a OTA (Over The Air) update. 3. Tap on OK to download the update. As the phones boots up you will be greeted with a all new Android 4.1 Jelly Bean home screen. Make sure you let us know what’s more in the update in the comments below!